TCID has been awarded $103,506 from Reclamation through the Water Smart Grant Program for automation of structures on the V-Line Canal. The district will automate six check structures within the V-Line Canal with placement commencing on the V-C3, through V-C8. This will enable level and flow control for more efficient water conveyance and increased public safety. 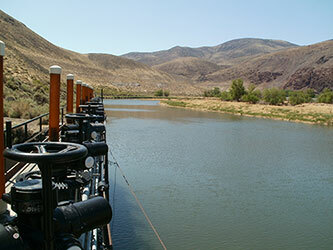 The project is expected to result in water savings of 3,445 acre-feet annually, which will allow for reduced diversions from the Truckee River. The backbone of this project is an in house designed and manufactured State of the Art SCADA and PLC control system. The heart of the system is the Automation Control Hardware. A PLC (Programmable Logic Controller) acts as the monitor, and controller of the system. Without any human interaction, the programming inside this device keeps the water level constant, while monitoring sensors, checking flows and levels, comparing those levels and flows to the set points for level and alarms, and monitoring itself for problems in the circuitry and logic. This system, devoid of any human activity, will continue to operate on its last received command indefinitely even after power outages. These new generation systems can run an entire water season without even having a human in close proximity. The systems currently installed in the Newlands Project doesn’t even get shut down in the winter, and will pick up right where they left off in the spring when the water returns. Although these PLC’s can run on their own, they also create a way from which all operations at the Automation can be monitored and logged. Monitoring is done via a HMI (Human Machine Interface) which takes the information from the PLC and formats it so a Human can look at it. The HMI can also log all actions of the Human, and PLC to keep historically accurate records which can be accessed or downloaded from the HMI. Uses for the log data, would be to investigate problems on the canal, get level and flow information for the season, help diagnose a problem with the automation itself, or can be used by researchers to improve canal operations, or help designers and programmers make the Logic in the PLC and the Structure Hardware more efficient. The HMI and PLC is coupled to WAN (Wide Area Network) so monitoring and control operations can be performed from practically anywhere. This allows operators to make changes to the level, or monitor flows from miles away, and also give maintenance personnel diagnostic tools to start to solve a problem, before they ever arrive on scene to make repairs. The entire Automation system is comprised of a Motor(s), coupled to gates through a gearbox, allowing open and closed operations. The motor(s) are wired to the PLC through a Reverse Contactor assembly allow PLC control. A water level Transducer and/or Flow Meters are added and coupled to the plc through a 4 to 20 ma analog input for the collection of data the PLC uses in making it’s decisions. Options like remote lighting, and cameras can be controlled by the PLC for night monitoring operations by humans in the field. The system culminates with an Alarm system, also controlled by the PLC that allows for callouts to be made for everything from Hardware and Software problems, to power failures, and signal losses, as well as cabinet or building intrusions. The V-line Automation Project will easily prove its worth not only in water savings, but savings on manpower, and vastly improved safety of the Canal Operations along the V-Line. Completion is slated for December of 2014.